More and more spiritual events and conferences are popping up all over the country. With technology, why not just stay home and do a conference call, or listen to internet radio shows or an online course? Having experienced both, it is easier to stay in my comfortable pajamas and cuddle up next to my computer and listen to an online course. But are we sacrificing a real life experience for convenience? You be the judge. I went to a Celebrate Your Life conference that is organized by Mishka Productions, a company that was started about 16 years ago by Ariel Wolfe and her daughters Liz Dawn and Jaime Babs. Although Ariel recently passed away, the two sisters continue to organize a four-day conference with the country’s top NY Times best-selling authors. 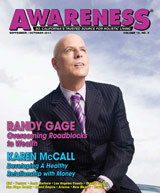 It is the “who’s who” of personal development and spiritual authors all in one place at one time. I don’t know how they do it, but they create an atmosphere where even in a room filled with over 1,000 attendees, you feel like a member of the family. Celebrate Your Life happens twice a year, Chicago and Phoenix. At the Chicago conference I attended, some of the speakers included: Deepak Chopra, Neale Donald Walsch, James Van Praagh, Caroline Myss, and the list goes on. I attended over 12 workshops within four days! It was energy and information overload, but truly extraordinary. This conference is by far the best event I have ever been to and I have attended many spiritual conferences. It has heart. This was not like one of those large events where you feel like just a number, I felt like family had come together. Liz and Jaime strive to create a loving and nurturing environment at Celebrate Your Life and they definitely achieve it. I think Elva R. from Mexico summed it up, “The energy is so high! The workshops are so inspiring and powerful…. this event has changed my life. I’m so glad I came,” she took a deep breath as tears began streaming down her face. This was the overall consensus and I could not agree more. There is a sense of community and joy at this event that can’t be experienced with an online course. The energy is magnificent! I met people who traveled from all over the world to attend Celebrate Your Life. Perhaps between my visits to the Celebrate Your Life conferences, I will use the online resources for support, but it will never take the place of being at this event. The next Celebrate Your Life conference will take place in Phoenix November 4-7, 2011. Some of the featured speakers include: Dr. Wayne Dyer, Dr. Andrew Weil, Doreen Virtue, Gregg Braden, Neale Donald Walsch, Dr. Jill Bolte Taylor and the list goes on. For more information visit: www.CelebrateYourLife.org or call Mishka Productions’ toll-free number at (877) 300-7352.